“Be strong and very courageous. Be careful to obey all the law My servant Moses gave you; do not turn from it to the right or to the left, that you may be successful wherever you go.” – Joshua 1:7. Entering the land promised to his forefathers, Joshua received instructions to stand against the influence of the polytheistic peoples in the land. He stepped onto that battlefield in obedience with strength and courage. “Therefore go and make disciples of all nations, baptizing them in the name of the Father and of the Son and of the Holy Spirit, and teaching them to obey everything I have commanded you.” – Matthew 28:19-20. There is nothing passive about being a disciple. The challenge for me, as with Joshua being careful to obey all the law, is to indeed be a disciple in practice. Only then can I boldly step onto the battlefield and be the Kingdom influence in this world the Lord expects me to be. Not ready to give up cable but my watching time has been greatly reduced, internet time pretty much business only and definite cell phone silence time. Loved your message today. 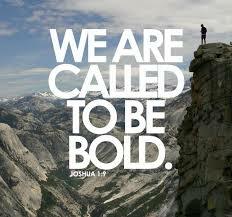 My only add on being bold, which I am not nearly enough, is to speak the truth boldly in love. I think that is how those visiting pastors got to the mayor. I needed this one especially with Saturday coming up!